The Boring Company has a new focus. The Boring Company has a new focus. Yesterday, CEO Elon Musk took to Twitter to let the world know that the company will prioritize mass transportation over individual vehicle usage. According to Musk, the Boring Company’s tunnels will “prioritize pedestrians & cyclists over cars.” He didn’t say that the tunnels would never support cars, but he believes that surrounding communities will benefit most if the Boring Company focuses on mass transportation. Most notably, Musk tweeted a video that shows what this vision might look like. In the video, a concept pod of sorts fills up with people at ground level. The pod’s destination, LAX Terminal 2, is lit up on its front and side like a hyperfuturistic bus sign. Next, the pod descends into the tunnel below, utilizing what looks a lot like the car elevator Musk unveiled last year, until it reaches a track. Then, it speeds through a tunnel at what the video proclaims is about 200 kmh (124 mph) while other pods zoom by on the surrounding tracks. He also described the plan as an “urban loop system,” noting that a single city could be home to hundreds of small stations. These many smaller stations would blend more easily into the urban landscape than the large subway or train stations currently used, according to Musk’s tweets. Previous Boring Company plans seemed to center around much larger, train-like hyperloop systems. However, this new pivot is not a complete departure from previous plans. “At the Boring Company, we plan to build low cost, fast-to-dig tunnels that will house new high-speed transportation systems,” a Boring Company spokesperson told Wired last year. 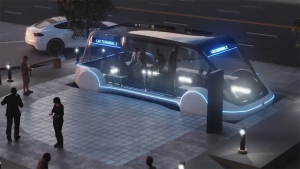 While the vehicle and station design might be changing to place a greater focus on mass transit, the Boring Company’s primary goal remains the same. They’re simply reworking design elements to better serve the public.